Recommended for oil-jacketed kettles. Designed for use on roads and highways. Very cold climates – flexible to -40°F. CrackMaster™ 3725 is a premium quality crack and joint sealant for portland cement and asphaltic pavements. As an economical and effective preventative maintenance treatment, CrackMaster™ 3725 prolongs pavement life by sealing cracks and joints from water penetration, which cause base failure and potholes. CrackMaster™ 3725 is formulated with selected asphaltic resins, synthetic polymeric rubbers, plasticizers, stabilizers, and inorganic reinforcing fillers. It is a hot applied, one part material that provides excellent results in cold weather and throughout repeated freeze/thaw cycles. It has superior bonding characteristics to both asphalt and cement surfaces. CrackMaster™ 3725 offers high resiliency, ductility, and resistance to weathering. CrackMaster™ 3725 forms a long-lasting seal which resists tracking in warm temperatures and remains flexible in cold temperatures. CrackMaster™ 3725 is recommended for sealing cracks and joints in portland cement, and asphaltic pavements. It is designed to seal expansion and contraction joints, longitudinal and transverse cracks, joints betwen concrete and asphaltic shoulders, and random cracks. Use material as supplied. Do not blend with other materials. After CrackMaster™ 3725 is melted it should be agitated or recirculated. Apply heated CrackMaster™ 3725 using either a pump and wand system or a pour pot. For best results the sealant depth to width ratio should not exceed 2 to 1 (i.e. 2-inches deep to 1-inch wide). The cooled sealant height should not exceed 1/8″ above surrounding pavement. Using a sealing shoe or squeegee, band the material 2 to 3 inches wide over the crack. 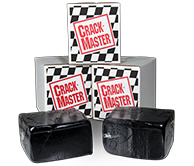 Protective apparel is recommended with application of CrackMaster™ 3725. The extremely hot material will cause severe burns on contact with skin. OSHA Safety Regulations require workers to wear the following types of safety attire (see current OSHA/Safety Regulations for additional information): Hard hat with face shield; long sleeved shirt buttoned at the wrist; heat resistant gloves; long, cuffless pants; and safety toed work boots. Make certain all area around melter is clear of all debris and flammable materials. Avoid breathing vapors. Use with adequate ventilation.